A second thought to me came about the Charity of Grace. Another argument I often give, when faced with the opportunity to share God’s grace with others is that I don’t know what they are going to use it for. If I give someone cash, they could use it to buy alcohol or drugs. Or what if they won’t use it? Like I buy something for the children, the parents take it away or return it for cash, again for ill purposes. Or what if they just flat refuse my help? The fact is those are just excuses to get me out of extending God’s grace to others. Christ gave without guarantee that we would use His grace, accept His grace, or not misuse His grace. I am called to live like Him. It is not my call to decide who deserves God’s grace through me. It is my responsibility to obey the prompting of God. It is my responsibility to steward as He directs. It is not my job to question God’s leading. He knows the bigger picture. It may be that the money will be used for ill purposes, but maybe it is in that time the person will hit rock bottom and hear from God for themselves and turn their life around. It may be that the desperate situation they are in is because of circumstances and the gift from God’s grace will help them live a new life. Isn’t that part of what God’s grace is for? Grace is to empower me to live a changed life? Doesn’t my giving, empower someone else to live a changed life? 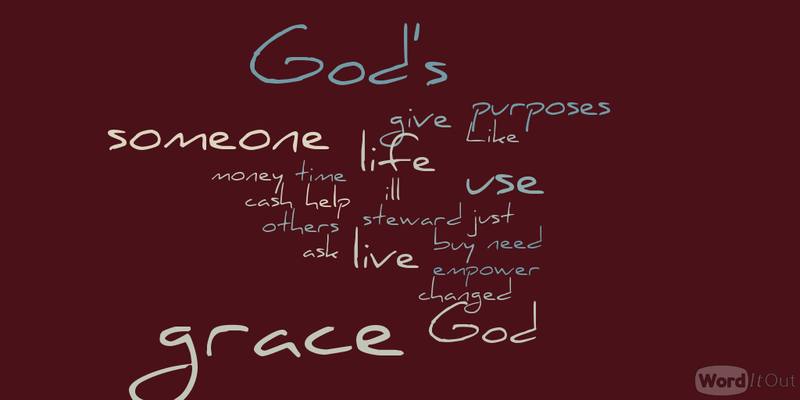 This entry was posted in Faith and tagged Character, Grace, hope, Lessons, Obedience, Purpose. Bookmark the permalink.